At the Salzburg Festival, intendants come and go. The most recent, Alexander Pereira, will leave next fall—two years before his contract was set to end—amid open conflict with local politicians and prominent artists such as conductor Franz Welser-Möst, not to mention threats from the Vienna Philharmonic about the future of its residency. Fortunately, Helga Rabl-Stadler has not left her office on the top floor of the Festspielhaus since her arrival in 1995. When Gerard Mortier scandalized conservative Austrian circles, she stood by his artistic vision. When Jürgen Flimm left prematurely for Berlin in 2011, she stood by the board while ensuring that the festival would not falter. The Salzburg native has broken more than one glass ceiling. Before becoming the festival’s first female president, she was the first woman to write a regular column on local politics for the Kurier newspaper and to serve in Salzburg’s Chamber of Commerce. Her economic know-how has proven essential to her position at what is widely held as the Olympic Summit of summer festivals. Pereira’s controversial expansion of events to include more new productions—and an accordingly increased budget—ultimately yielded a record high in ticket sales this year. Reminded of that in an interview with this writer last summer, Rabl-Stadler pointed out, with characteristic practicality, that surging technical costs would yield a deficit. The newspaper Der Standard projects that Festival personnel costs will rise as much as 13 million euros by 2016. And who will have to balance the budget? You guessed it. 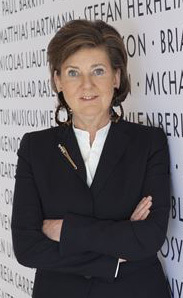 Although she had planned to step down next year, Rabl-Stadler extended her contract through 2017 to ensure that all runs smoothly through the interim reign of Theater Director Sven-Eric Bechtolf. The recently appointed Intendant Markus Hinterhäuser does not officially take over until 2016.